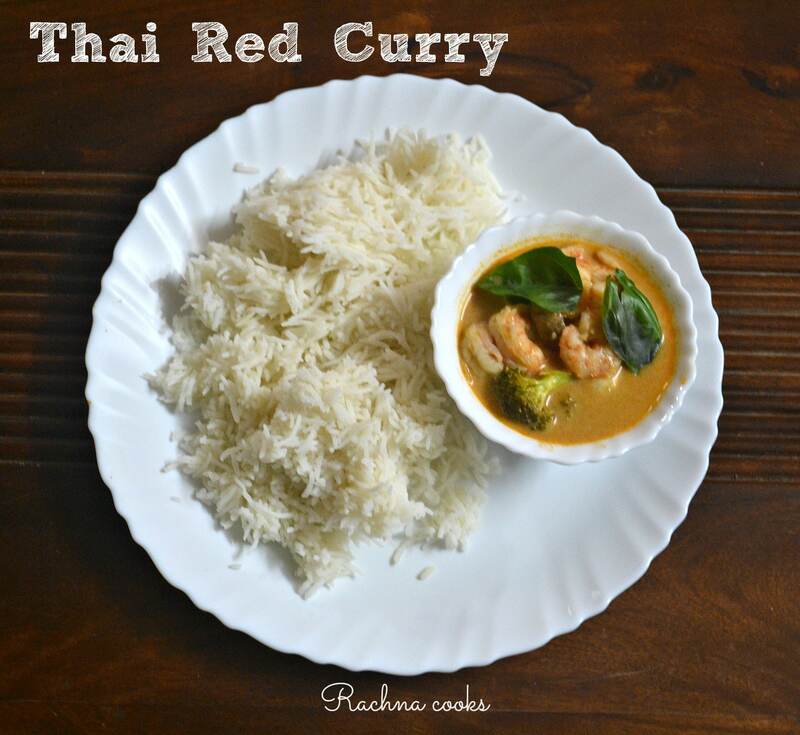 This is a comforting spicy, salty and tasty Thai red curry with prawns. You can make it vegetarian or with chicken. Have it with boiled rice. Heat oil in a large wok. Put in the thai curry paste along with chopped lemon grass if using and cook for a couple of minutes. Since I was using broccoli, I put it in first along with capsicum. Cook it for 2-3 minutes and then add coconut milk. Let it simmer on low heat for about 3-4 minutes. Add the fish sauce optional and then tip in the mushroom and the prawns. As they don’t take much time to cook, I have added them towards the end. Add in the palm sugar and salt and cook for a couple of minutes covered. Now remove the lid. Switch off the gas and add lemon juice. Taste and adjust seasoning. Your Thai Red curry with prawns is ready to serve. Garnish with basil leaves and chilly slices and serve hot with boiled rice. I have used basmati rice here. Heat oil in a large wok. Put in the thai curry paste along with chopped lemon grass (if using) and cook for a couple of minutes. Since I was using broccoli, I put it in first along with capsicum. Cook it for 2-3 minutes and then add coconut milk. Let it simmer on low heat for about 3-4 minutes. Add the fish sauce (optional) and then tip in the mushroom and the prawns. As they don’t take much time to cook, I have added them towards the end. Add in the palm sugar and salt and cook for a couple of minutes covered. Now remove the lid. Switch off the gas and add lemon juice. Taste and adjust seasoning. 1. You can make your own red curry paste but often ingredients like galangal, kaffir lime leaves are a bit difficult to source. The store bought stuff is quite good actually. 2. If using chicken, cook it from right in the start as it takes a longer time to cook compared to prawns. If using tofu or paneer, use it at the end. 3. You can skip fish sauce if you don’t enjoy its taste. 4. You can use any vegetables that you enjoy and can source. You can use brinjals and potatoes too in the curry. 5. Preferably use thick coconut milk to make the curry rich and smooth. 6. Adjust heat, sweetness and tartness as per your taste.